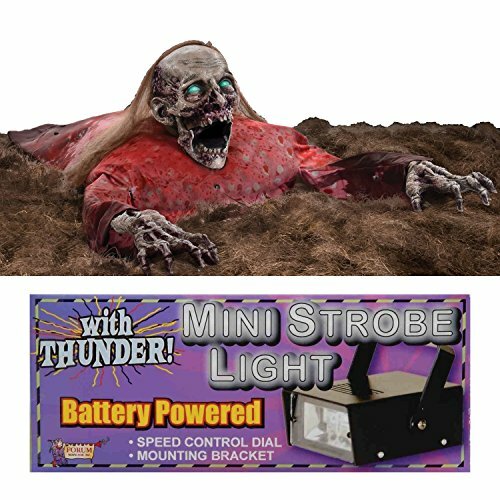 This Clawing Cathy Animated Prop with 1 Mini Strobe Light with Thunder Sounds Bundle is reaching out to you! Ghastly and terrifying, the Clawing Cathy Animated Prop measures 4 feet in length from the end of the fabric to where the arms end, 2 feet in width, and 15 inches in height. The prop features a half torso with a rigid PVC moving head and light-up eyes, a moving mouth with sound, a fabric dress with gauze details, and a sturdy metal frame with an attached motor. Her eyes light up as she attempts to claw and grab her way towards you. The prop also includes a volume control knob that allows you to adjust the volume of the prop. This Halloween Decoration includes a standard UL adapter that allows it to be plugged into any standard outlet and is activated via Steady-On, Infrared Sensor, or Step-Here Pad activation options. When the Steady-On option is selected, the item runs continuously on a loop. When the Infrared Sensor option is selected, the IR sensor is activated for one cycle any time someone comes within an 80-degree angle of the sensor. The IR sensor has a range of up to 2 meters and can work in all lighting conditions (from bright light to no light!). Lastly, when the Step-Here Pad option is selected and the pad (included) is plugged into the control box, the item runs for one cycle each time the pad is activated. For an added effect to this Clawing Cathy animatronic, this bundle also includes a strobe light. The Mini Strobe Light with Thunder Sounds measures approximately 3.5" x 2" x 5". It is battery powered (3 "AA" batteries) with a speed control dial. The strobe light has a mounting bracket for easy hanging and standing. The mini strobe light can be set to strobe only, sound and strobe, or off. Please use caution when determining mini strobe light placement near decorations. If you have any questions about this product by Fitco, contact us by completing and submitting the form below. If you are looking for a specif part number, please include it with your message.